In addition, chickens that are kept in a coop are protected from predators, prevented from entering neighboring properties, and kept out of the garden and flower beds. In an ideal world all chickens would be allowed to run free to forage for food. But not all chicken farmers can afford to allow their chickens to roam at will. Why not? There are at least 3 reasons. Many farmers also have a vegetable garden, and although chickens will eat harmful bugs in a garden, they will also inflict heavy damage on plants and vegetables. Chicken owners also need to respect land joiners who may not be thrilled about their neighbors chickens exploring their backyard. A third drawback to free range chickens is the susceptibility that chickens have to becoming a meal for a hungry fox or hawk. A good alternative to free range chickens is a limited range setup using a coop on wheels. A chicken coop on wheels (or chicken coop tractor) allows the chickens to forage in a protected area where predators don’t have access. Chickens will also be kept out of the garden and the neighbor’s backyard. 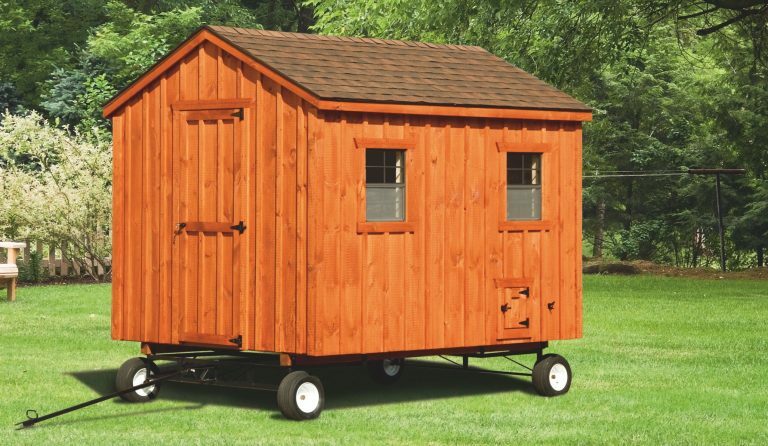 A chicken coop on wheels can be moved with relative ease through the use of a wheel system or chicken coop tractor. Each time the coop is moved, the chickens have access to a fresh foraging area. Chickens can help to control a wide range of pests in your yard. 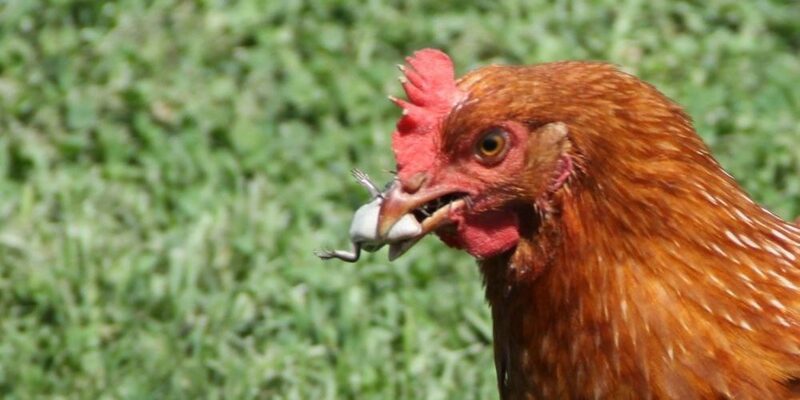 Among a long list of bugs enjoyed by chickens, chickens readily feast on ticks, slugs, grasshoppers, pill bugs, spiders, termites, and flies. Are you concerned about the number of Lyme’s disease carrying ticks in your backyard? Although a flock of chickens will probably never eliminate all ticks in an area, chickens have been known to reduce the number of ticks in a yard. Guinea Fowl are known to be even more effective than chickens at controlling ticks. Researchers have demonstrated the effectiveness of Guinea Fowl at reducing the tick population with this study conducted in 1992. A chicken coop on wheels can be used to reduce the pests in your garden organically. By moving the coop every few hours around the perimeter of your garden, you can reduce the number of pests that feast on your hard-earned vegetables. Another solution is to build a 5’ wide area using chicken wire fence around the perimeter of the garden for your chickens to run in during the day. Your chickens should still be locked securely in the coop at night. Below is a testimony from a farmer with a pill bug problem. Thanks to Mother Earth News for allowing us to use this story. In 2016 NPR published an article about farmers who enlisted chickens to fight against pests in an effort to stay away from chemical pesticides. In the article, Gary Wennig purchased a plot of farmland that was full of weeds and insects. Wanting to stay away from pesticides, he decided to experiment with organic pest control by planting “trap” crops that attracted the harmful insects around the perimeter of his field. He then used a chicken tractor with a few chickens inside to allow the chickens to feed on the pests in his “trap” crop patch. This arrangement has worked well for Gary on his small crop farm. In the following video learn how an experienced gardener uses chickens to help control the pest population. In addition to reducing the local pest population, allowing chickens to scratch and forage in the yard also adds a valuable source of protein to their diet. Although the amount of feed that a chicken needs every day will vary depending on a number of factors, a single chicken may eat as much as 1.5 pounds of feed per week. Since chicken feed is one of the largest regular expenses related to keeping a flock of chickens, finding ways to reduce that expense is an important part of making chickens pay for themselves. Small-scale chicken farmers have found that giving chickens even a half-day of foraging time can significantly reduce the amount of feed that is consumed. Another benefit of a chicken coop on wheels is that it allows your chickens to fertilize your lawn naturally. Chicken droppings contain nitrogen, potassium, and phosphorus and can effectively enrich the soil. If your chickens are foraging in your lawn, you’ll want to avoid using chemical weed killers and fertilizers to treat your lawn. Foraging chickens will easily ingest the chemicals which could cause health issues for the chickens and temporarily ruin your prospects for organic eggs. Instead of using a chemical treatment for you lawn, allow your chickens to fertilize and weed your lawn naturally. The trick is to use a chicken coop on wheels so that your entire lawn can be covered without creating a “dead spot” from overgrazing. We offer five wheel options for our chicken coops for sale that turn your coop into a bug eating, chicken feeding, lawn fertilizing machine. The wheel option that works best for you is largely determined by the size of your coop. Two wheels on one end with wheelbarrow handles on the other end. Best for our smallest coops and tractor coops. Four large caster wheels with a handle that can be pulled by hand or attached to a garden tractor or ATV. Best for smaller chicken coops. Includes two wheels that can be lowered with a lever. Used in conjunction with wheelbarrow handles to move tractor coops and runs. For smaller coops. 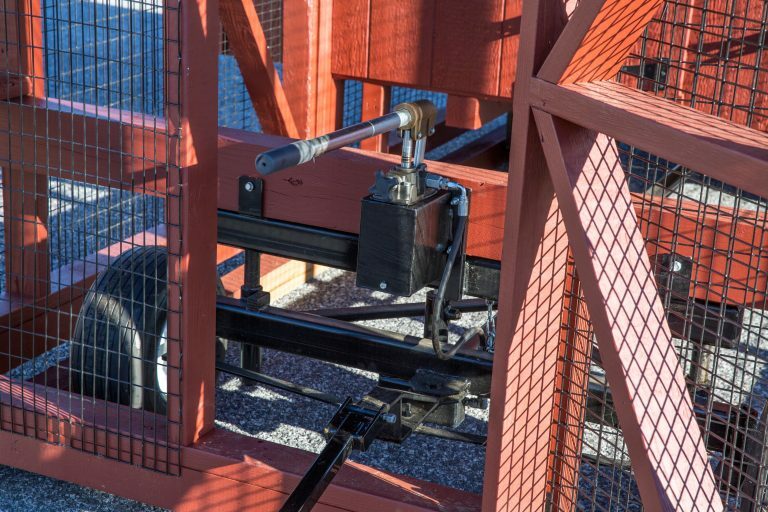 Four wheels on a welded frame with a hydraulic lift that is hand operated by a pump with a handle. After the coop is lifted it can be moved using a tractor or ATV. Best for our mid to large sized coops. 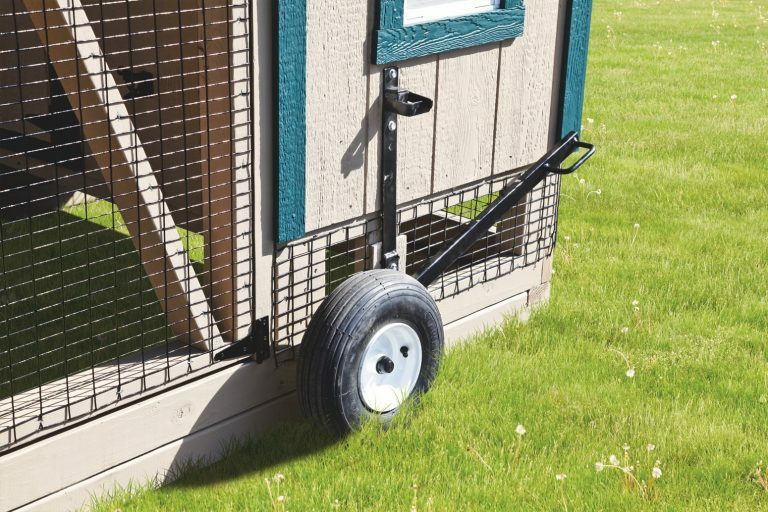 Our chicken coop wheel options allow you to make the most of available foraging space for your chickens without setting up a large fenced in area. It also allows your chickens to graze during the day in an environment that is protected from predators. We can add wheels to almost all of our available chicken coop sizes and styles. 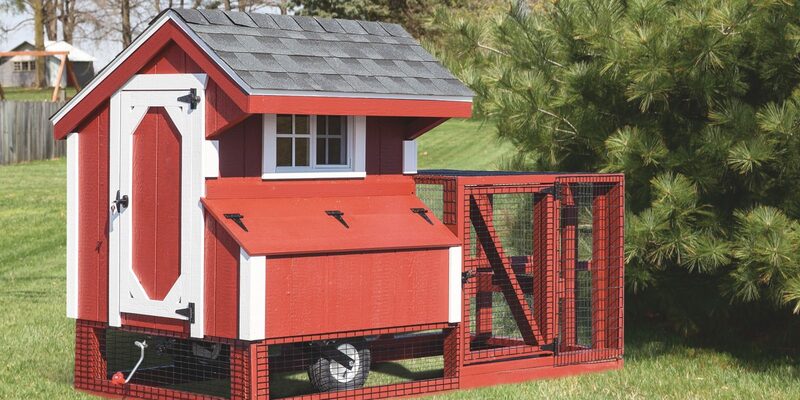 With a chicken coop on wheels you can experience more of the benefits of farming with chickens. 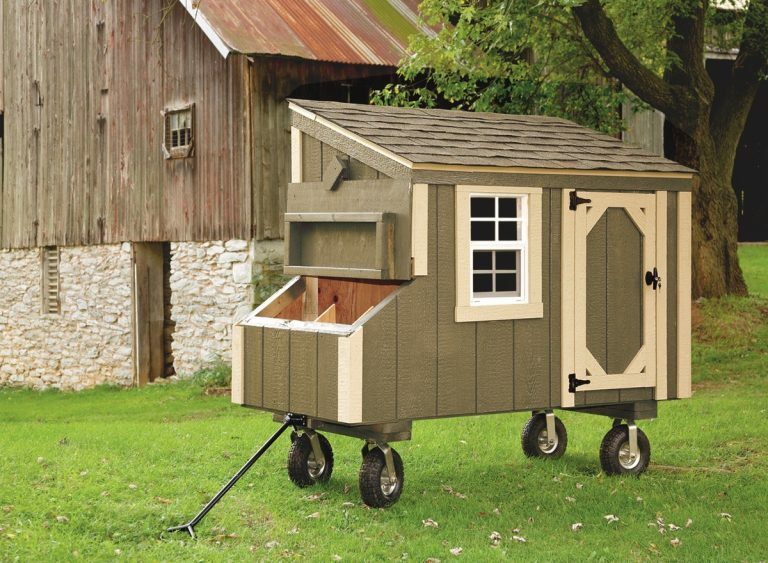 Do You Need a Chicken Coop on Wheels? A chicken coop on wheels can potentially change the way you farm chickens. 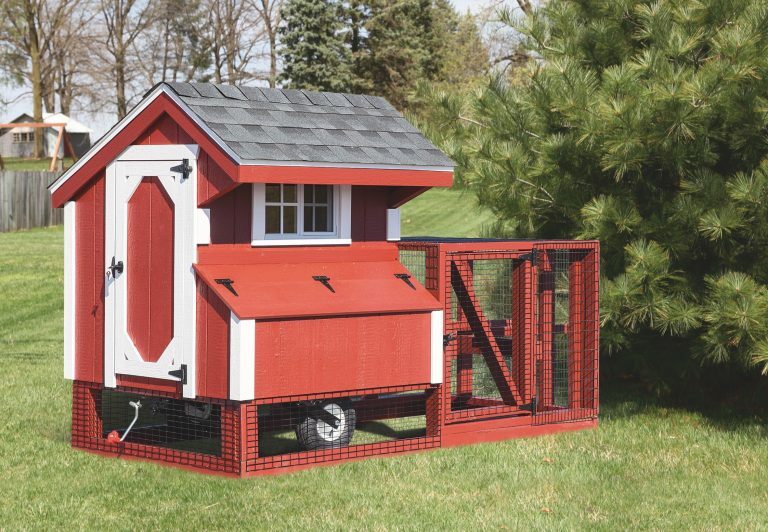 We would love to connect you with your chicken coop on wheels (we ship all over the U.S.) Take a moment to browse our chicken coops to find yours.